I don't know how many of you watch Tekken 6 Yoshimitsu Movies everyday like I do, but people who watch them enougth might have noticed that Yoshimitsu has a new move which is fimlier to Raven's d/f+1 move. 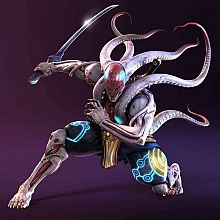 I hope Yoshimitsu has not be givin the same properties, because that would just be a bad move from namco. It's not from Raven in any way. It's just a standard d/f+1 which everybody MUST possess (even Heihachi, which nerfed him badly), otherwise they wouldn't be able to juggle after a successful low parry. As some of you know, after a low parry in Tekken 6 there's about 13 frames of advantage and a "lift status". After hitting an opponent with a standard d/f+1, Yoshi can continue juggling. Nice and is that greanted Tenshi? or is it with only lets say quick frame juggle starter moves? otherwise they wouldn't be able to juggle after a successful low parry. ... please read carefully. d/f+1 lifts for a short juggle ONLY after a successful low parry.